Being snowed in on Friday was fun. You see, when I have a day off of work, I have a tendency to want to leave the house and run errands or shop. 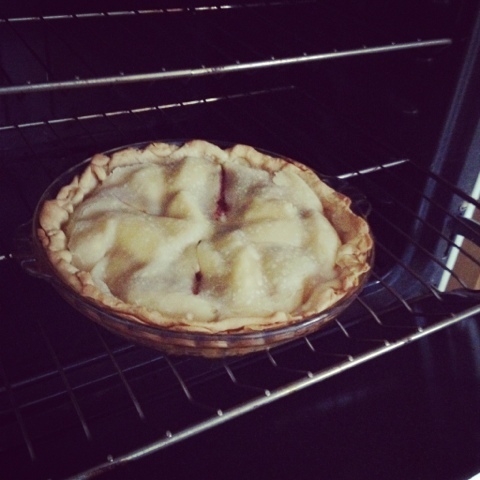 Since our area got hit with about 5 inches of snow, I stayed indoors and cleaned, baked apple pie, read magazines and a book, watched One Day and drank a beer. I had dinner plans with my friend Danielle to celebrate her birthday. 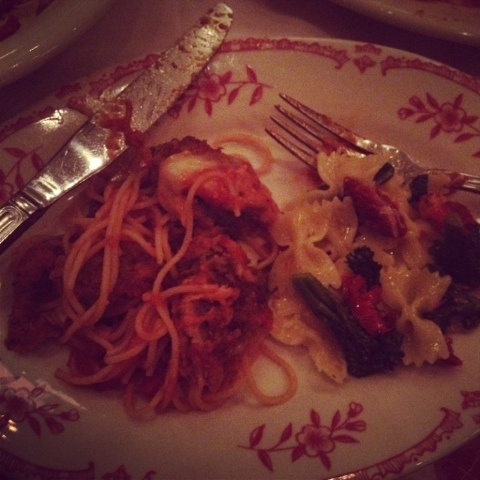 We had plans for another restaurant originally, but we changed our mind and went to Maggiano’s instead. It was my first time eating there, believe it or not. Danielle and I shared the Marco’s meal for two and got bruschetta, Eggplant Parmesan, Bowtie Aglio, and creme brulee for dessert. All were so delicious! The bonus was that I got to bring home a portion of Mom’s Lasagna for Craig too. 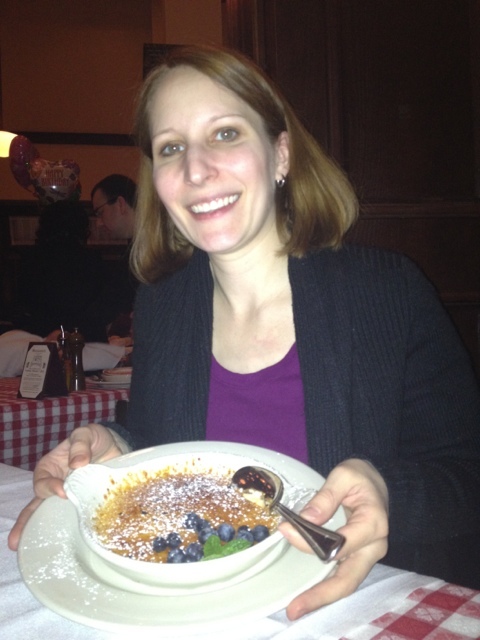 Danielle and I both love creme brulee! Yum! 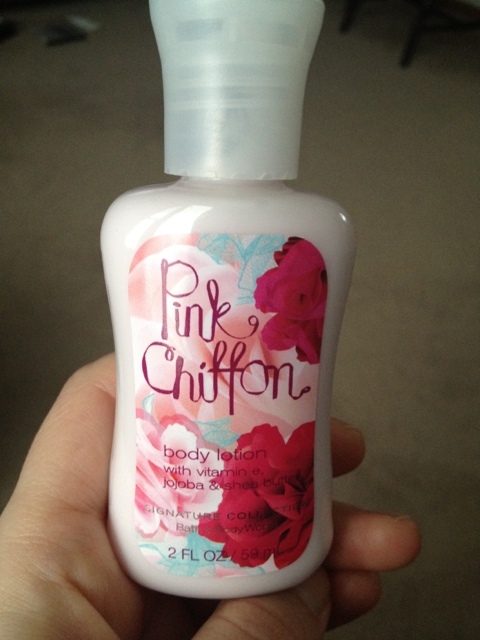 We stopped at Bath and Body Works and both got a small bottle of the new scent there, Pink Chiffon, for free. It was a Facebook promotion. I tried it out today and it smells pretty good, but I probably wouldn’t buy it again. Today was definitely the day that got away from me and I feel the same way about the weekend. It went by way too fast! 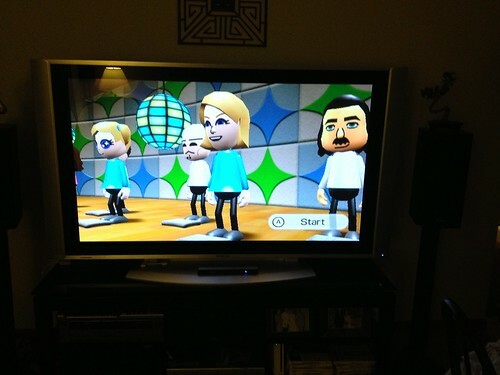 Craig and I always go to the gym on Sunday mornings, so today was no different. I had half of this bar before we left. It was my fourth day in a row getting to the gym and it feels so good to go consistently. 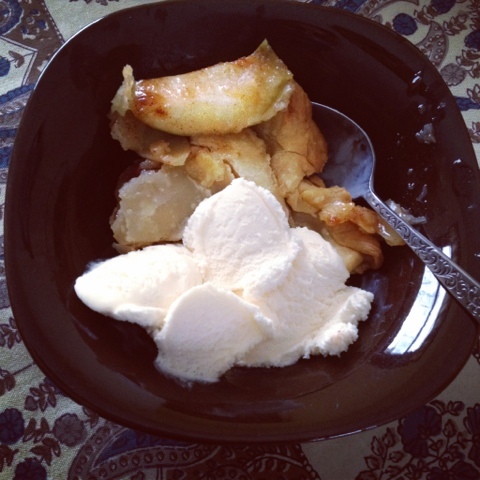 I was starving when we got home and I couldn’t wait for my leftovers of Maggiano’s and apple pie with ice cream for dessert. After a nap with the kitties in bed, we got up and out of the house. 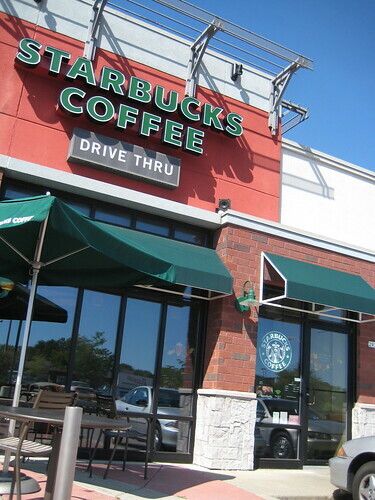 We stopped at Starbucks first for a strawberry smoothie. We discovered something new by the sugars and creamers. 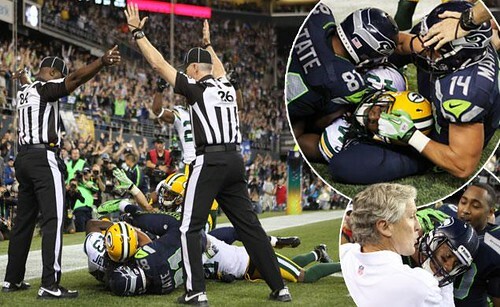 The little gems pictured below. 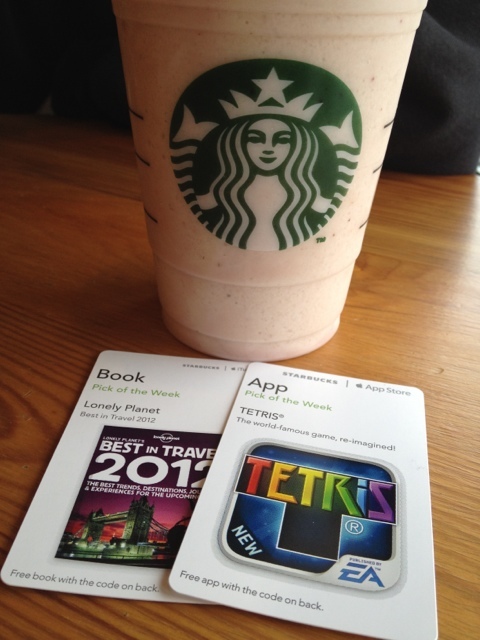 Usually they’re free songs and now they have ones for free apps and books from the iTunes store. Love me some Tetris and I’ve already played it once today. Craig also downloaded it for the iPad. Can’t wait to see what other little freebies they have to offer in the future. Well, after meditating, I felt a bit funky and like I was starting to get sick, so I better go and relax. I am watching and listening to the Adele Live DVD while I blog. It’s so good. I hope I can see her live someday. Her voice is just amazing, don’t you agree? Good morning! Just a quick post for you because I need to shower, get ready and then head to the salon for some highlights. It was so nice out yesterday, so I took full advantage of it by taking two walks at work. 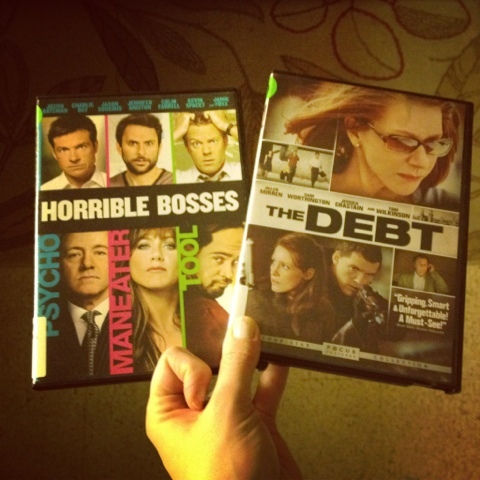 First, I took my fifteen minute break to walk to the library to return a book and pick up two DVDs. The second walk was during my lunch break. 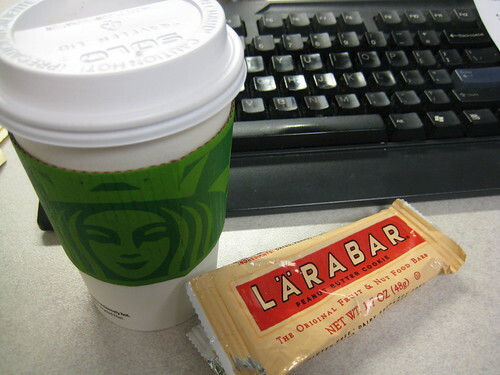 I worked at my desk and ate and then I headed over to Starbucks with my empty coffee bean bag tucked away in my purse. I got a cup of the Pike’s Place roast (one of my favs) and relaxed by the window. Then I took my coffee for a walk and headed back to the office. It felt so good to get outside of my cubicle. That cup of coffee helped me power through my Friday afternoon and get a bunch of stuff accomplished. After quitting time, Craig and I made light mac and cheese together, I did some laundry and then we watched Horrible Bosses. It was different than we thought it would be, but we both enjoyed it. I am looking forward to seeing The Debt tonight. 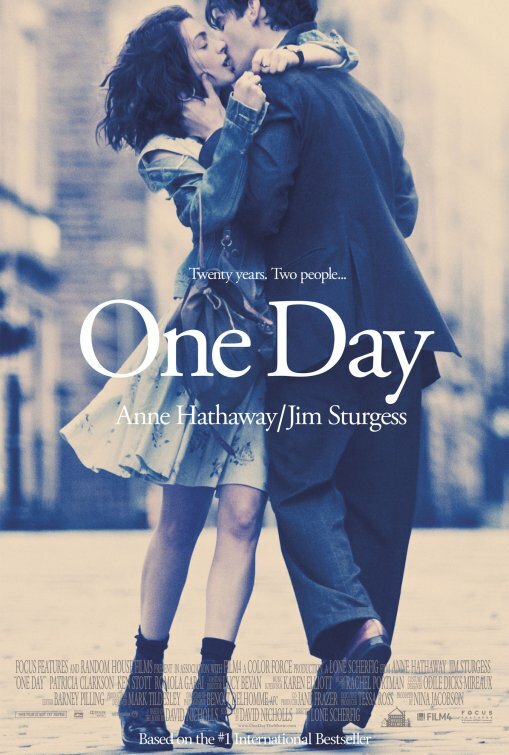 It’s set in Berlin and since I have been there twice and love it, I enjoy seeing movies set in the city. I guess it’s not great to talk about work in general on the blog and I do it more than I should when I am feeling down about it, but have you ever had a horrible boss? When I lived in California, I had the worst boss and I can’t believe I put up with her or that she got away with the stuff she did to me and another female co-worker. Luckily, I have had two good ones since then. One of them reads my blog and she was definitely the best and most supportive boss I have had. It felt good to sleep in a bit this morning, but then that meant that I missed my morning workout, which was crucial because we were gone for the rest of the day. Oh well. Must get back to the gym tomorrow! I met my friend Angie at Starbucks and poor girl has been going through some major health issues that the docs haven’t quite seemed to figure out yet. I really hope she gets some answers soon. 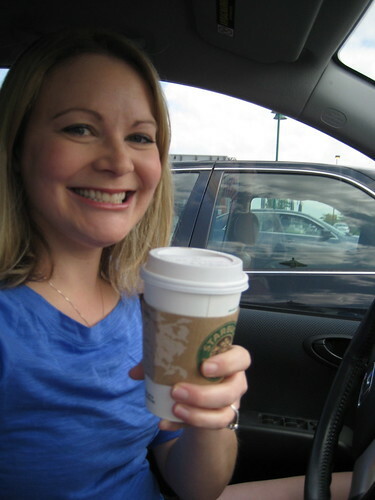 I enjoyed my first Pumpkin Spice Latte of the season. They’re expensive, so it’s not like I will be buying them every week, but to have one as a treat once in a while will be nice. My goal is to actually use this tutorial from daily nibbles (which is Freshly Pressed right now) and make my own Pumpkin Spice Latte soon. 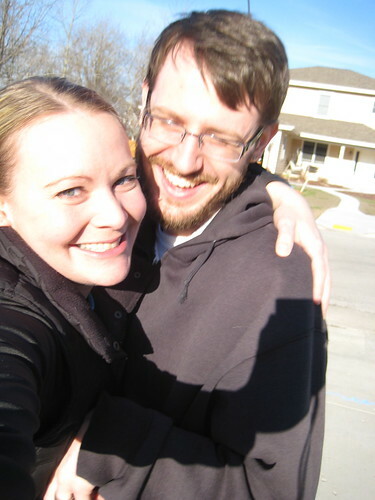 After quickly eating lunch at home, Craig and I left for my parents house. 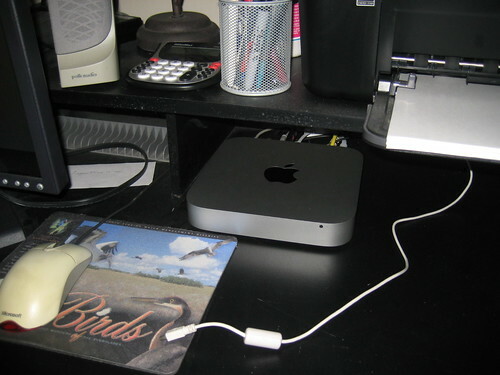 Craig spent the whole afternoon setting up the Mac Mini and then we gave my parents a quick overview. They mostly use their computer for the internet, but at least we taught my mom iPhoto and some other programs. 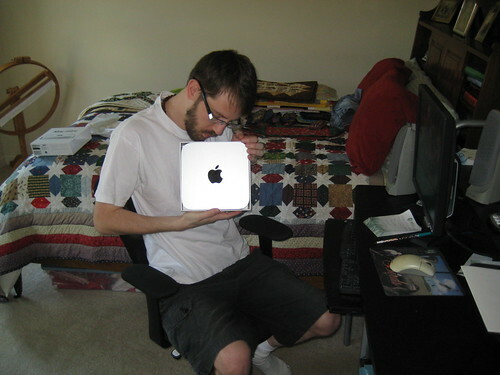 My parents and I stayed out of Craig’s hair while he set everything up and transfered their old stuff over. 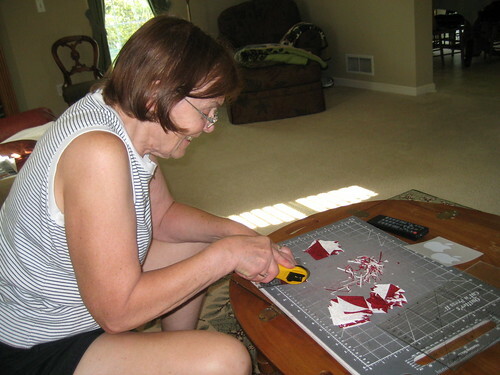 My mom worked on her quilting. 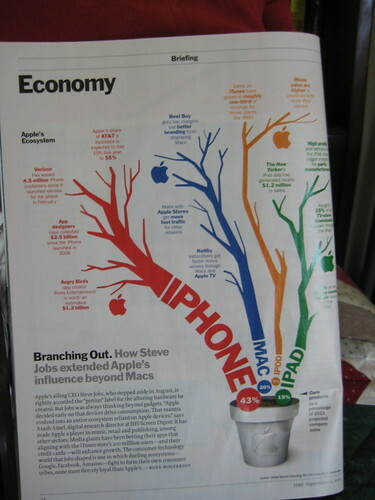 I enjoyed reading this issue of Time magazine. 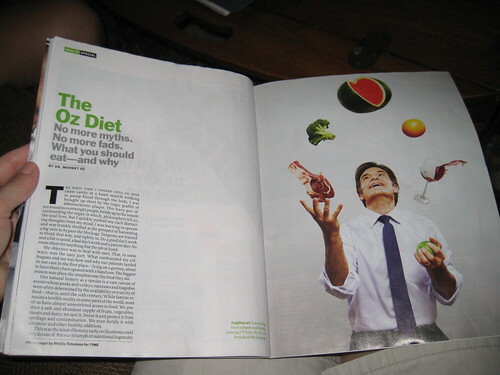 I loved the Dr. Oz nutrition article. My favorite quote was the final one he left readers with. 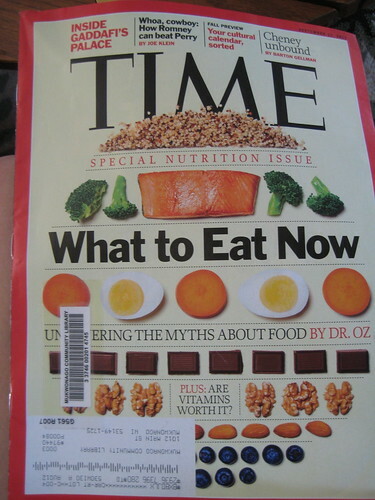 Reading this inspired me to improve my diet. I think I eat pretty healthy, but I honestly can say I haven’t been incorporating enough nuts, avocados, and protein in general into my diet. 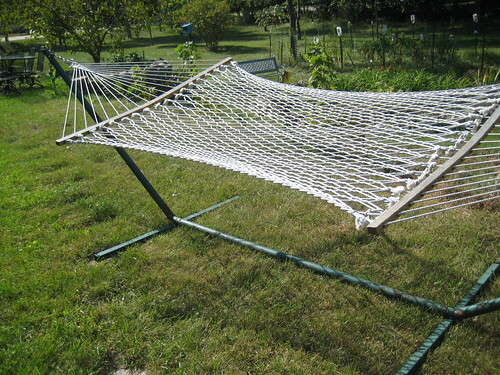 It was nice to lay in the hammock and read in the sunshine. 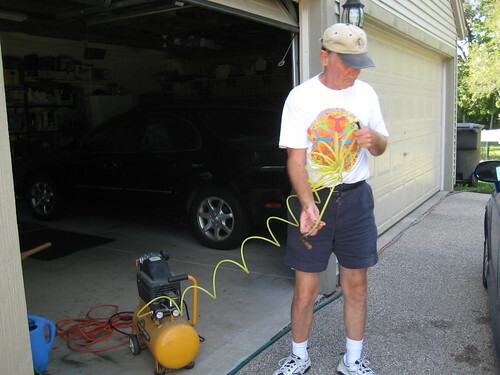 …while my dad pumped up the tires in my car. 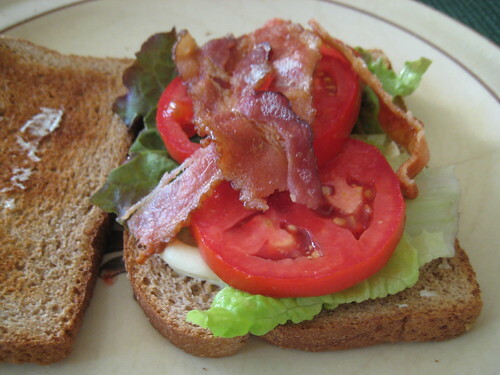 After the Mac was all set, we had BLTs for dinner. 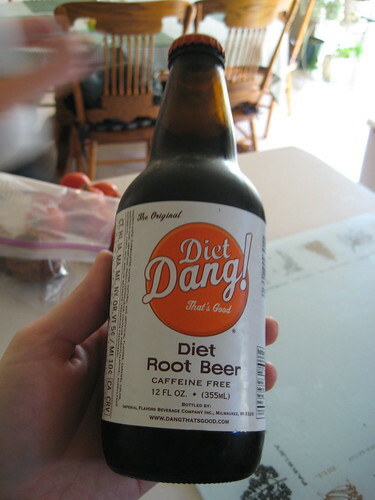 I enjoyed a soda I had never heard of before–Diet Dang! 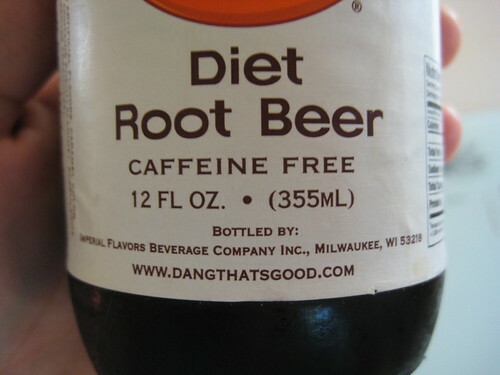 That’s Good Root Beer and it’s made in Milwaukee! 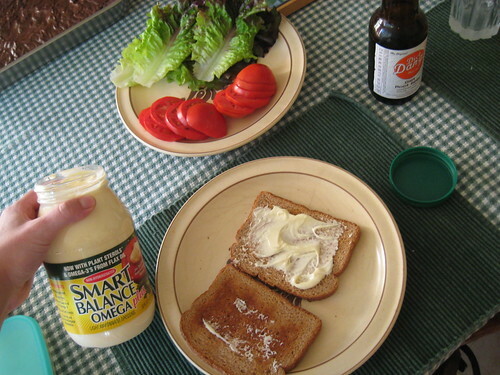 My parents usually use Miracle Whip, which we don’t love, so my mom pulled out this Smart Balance mayo once I told her how I disliked the whip. 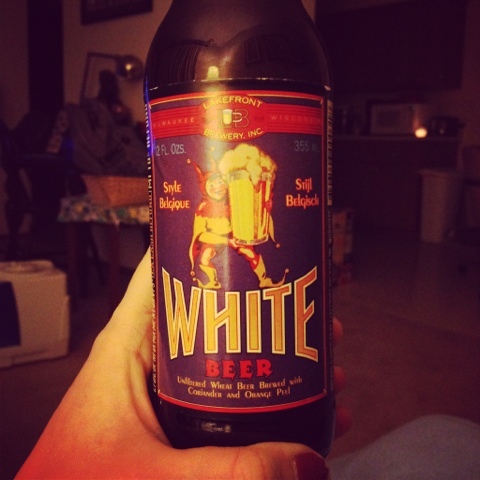 I liked the flavor much better! 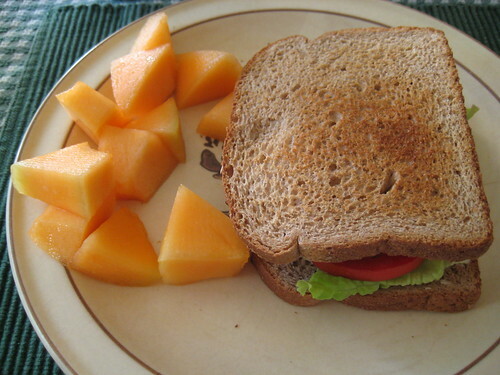 Also had some yummy cantaloupe on the side and a lemon bar and brownie for dessert. I feel so behind on everything since we’ve been gone all day, so adios y feliz fin de semana a todos! What a relaxing day off it’s been so far! Today’s title is “trade ups” and you’ll see why. 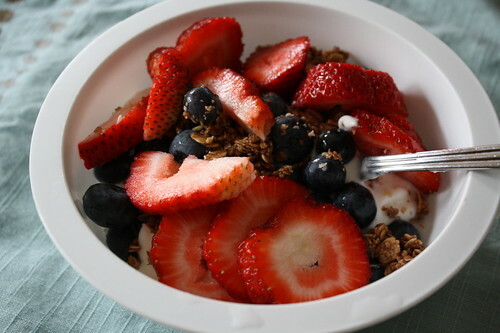 I woke up at the same time as Craig and had a big bowl of Chobani, berries, and granola for breakfast. While looking at the huge strawberries from Sam’s Club this morning, Craig and I wondered the same thing at about the same time (which is pretty common for us). 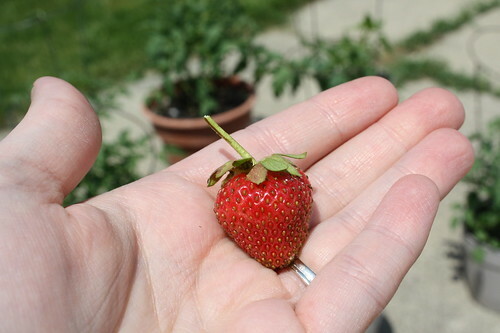 Why are our strawberries so small compared to the ones you get in the store? We thought it was some kind of growth promoting chemical (not sure how else to describe it) that the farmers use. Anyone know? 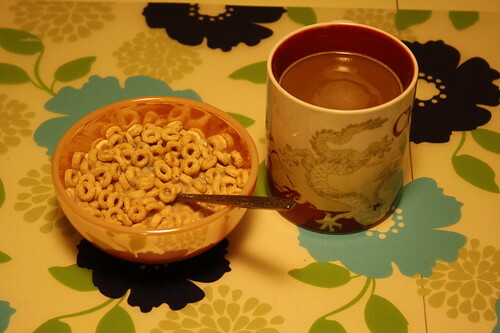 After breakfast, I just lounged while watching the Today show and reading blogs. 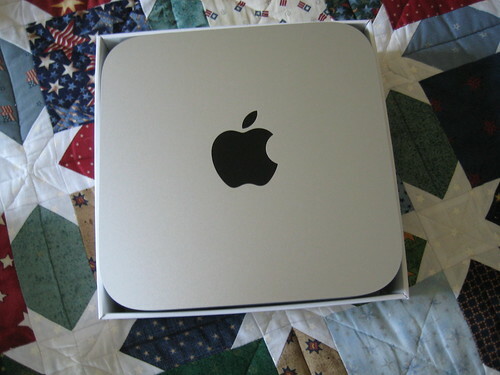 I also entered some giveaways, one of which I won today from Will Jog for Food! This is what I scored. Sweet! 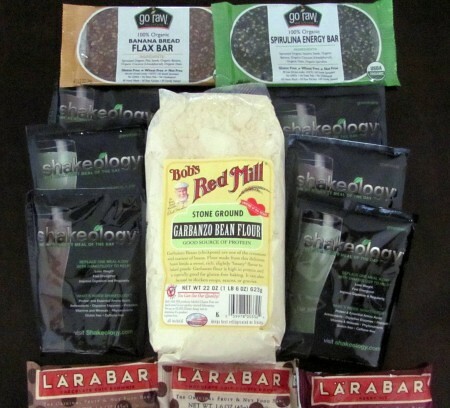 Of the items I won, I have only had larabars before, so I can’t wait to report back on how the other products are. I didn’t feel like going to the gym this morning, so I ran errands instead. 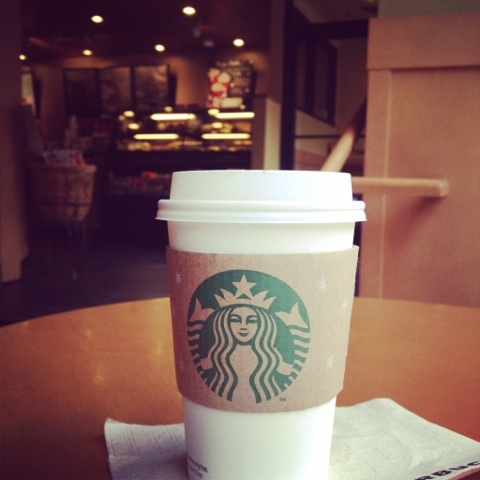 For this at Starbucks. 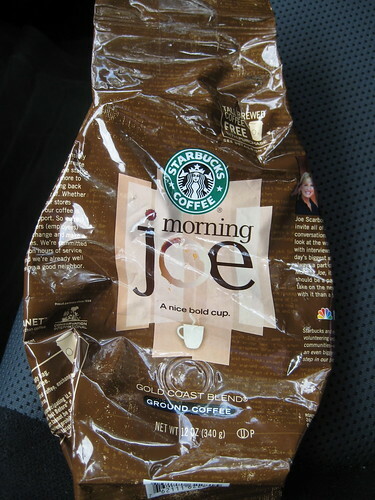 I wanted an iced coffee, but you can only trade the empty bag in for a hot coffee. I went to Target to try on some dresses (fail, none looked great) and to buy misc. things like toothpaste, lotion with SPF in it, conditioner, and some nickel free earrings. 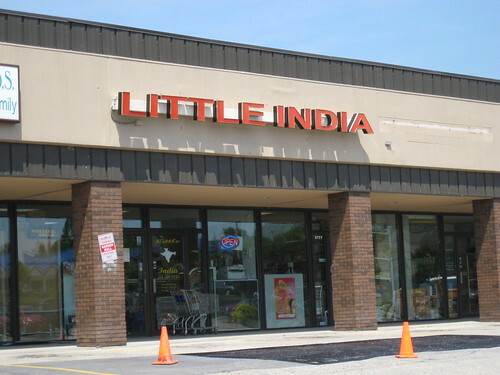 After my Target run, I finally went to Little India grocery store. I pass it on my way to the gym and have always wanted to check it out. It offered a nice selection of Indian foods! Lots of huge bags of basamati rice for only $10 or $15. 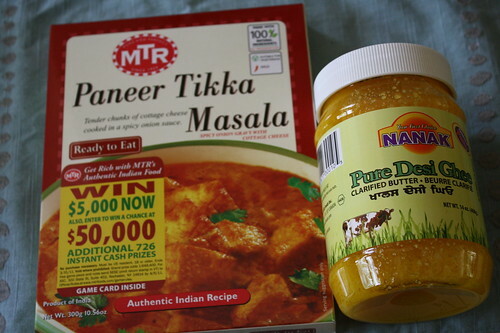 I picked up Ghee and a boxed Paneer Tikka Masala. Now I just need to get some more ingredients to make one of the recipes from my Indian cooking class. For these beautifully polished, well-scrubbed, lotioned, and massaged feet/legs. Aaah, I love to treat myself to pedicures but I very rarely get them. Lunch was pretty much the same as yesterday–a turkey sandwich with cheese and mixed greens on a french baguette. 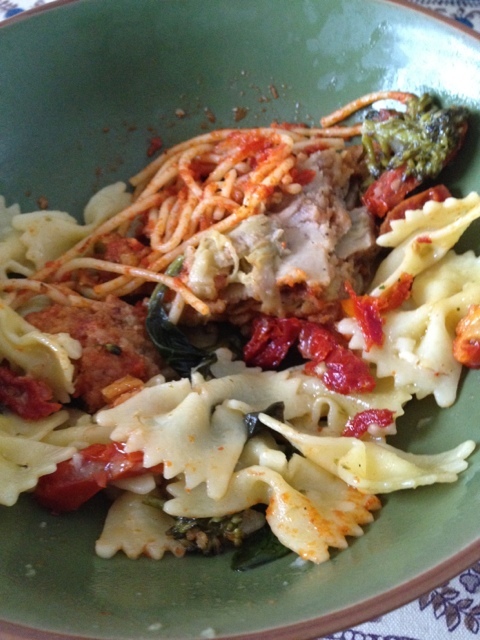 We have a huge bag of grape tomatoes to use up, so I had a bowl of those on the side. My drink was a Bolthouse Farms strawberry banana smoothie. I’ve rested my stomach long enough and I think it’s time to take a bike ride. It’s such a lovely day outside that I hate to waste it indoors! Hope you wonderful readers are having a great Friday! Instead of going to the gym bright and early, I chose sleep and the comfort of my bed on a Saturday morning. 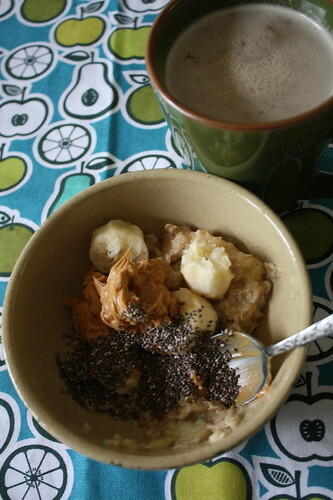 After having stovetop oats with banana, various spices, chia seeds and peanut butter, I showered and got ready to head out of the house. 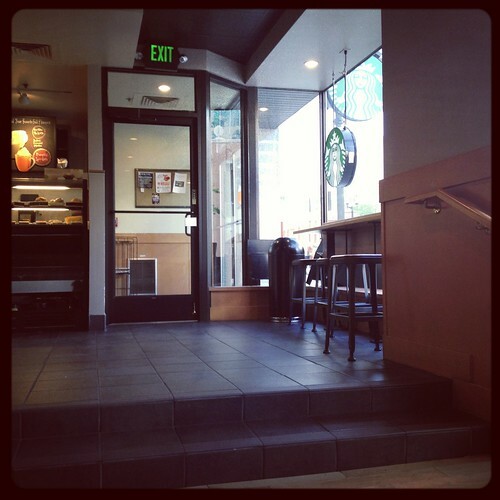 I went to Starbucks to meet my friends, but found no one there. After waiting a couple of minutes and not having reached anyone by phone, I left and went to Ulta to shop. Out walked my friend Kim and she was surprised to see me. Apparently she texted everyone about our meet up, but you see, I don’t receive texts. They are literally blocked from my phone and my mom’s (we share a plan) and I like it that way because we used to receive too many junk texts and paid for them. I picked up two Aveeno products for a mere $6 something with tax (I saved $6 by combining a $5 off Ulta coupon and a $1 off manufacturer’s coupon). I bought exfoliating body wash (for sunless tanning purposes) and their moisturizing and volumizing shampoo, which Kim highly recommended and which I wanted to buy anyway because I loved the samples of that shampoo I used last summer. Kim and I went back to Starbucks and I got an iced coffee, which I am now addicted to since it’s getting warmer out. We parted ways and I was off to the Brownberry outlet to get various breads. After running a few other errands, I went to my parents’ house out in the country. In the first couple of minutes I was there, I managed to freeze my mom’s kindle and had to restart the thing with my husband’s help. I finally helped my mom with a few things on the kindle and then cleaned up their computer by removing some programs. 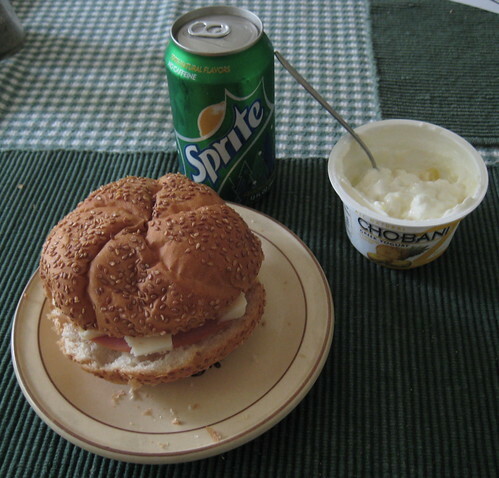 I also ate lunch there–a ham and cheese sandwich on a roll, a pineapple chobani and a sprite. I stopped at a Wal-mart on the way back home and while I usually don’t like to patronize them for my groceries, I really didn’t feel like going back out to a grocery store once I got home. I found strawberries for $1 and Stonyfield yogurt cheap. Surprisingly, I also walked away with some Danskin shorts, a tank top and a t-shirt, all from the Danskin Active line. 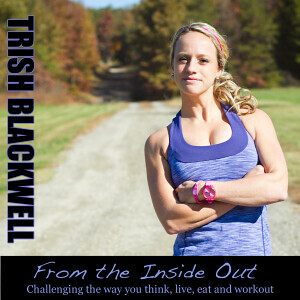 I recommend it if you are looking for reasonably priced workout wear that also fits nicely. After a 20 minute walk with Craig, I decided that was all the exercise I would get for the day because I needed to make dinner, meditate and do other things around the house. 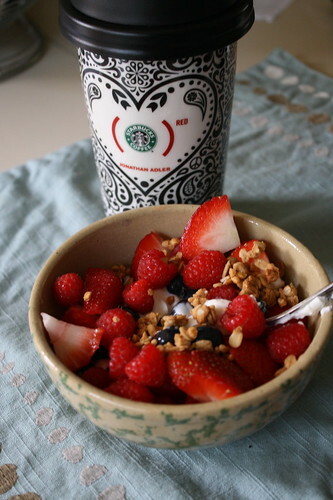 I pressed some tofu and ate Chobani vanilla yogurt with cocoa granola, strawberries and blueberries while I waited. I dug out our George Foreman grill and grilled tofu and asparagus on it for the first time. I really liked how firm the tofu got by grilling it and now I’ll probably always want to make it this way! I topped it with Frank’s Red Hot and paired my dinner with a Fat Tire New Belgium beer. Dessert was a few bites of pumpkin pie. My mom made some today and gave me a few pieces to bring home. 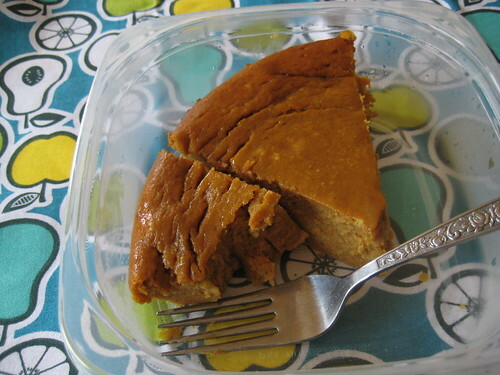 Aaah, I missed the taste of pumpkin! Why do we only seem to eat it in the fall? 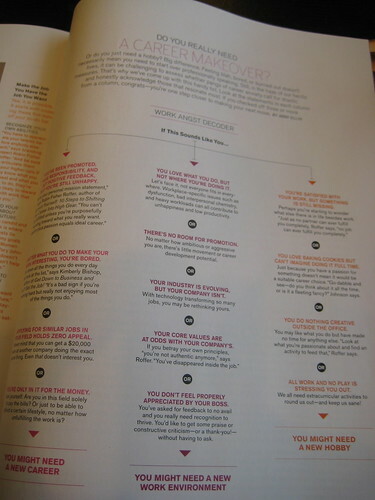 Well, this post got a bit long and I want to go read some blogs. It’s move night in our house, but unfortunately, I don’t like the selection: District 9. Craig is watching it while I blog and watch it off and on. Not a science fiction kind of girl. Well, I am picky about my science fiction I guess. Happy Earth Day everyone! 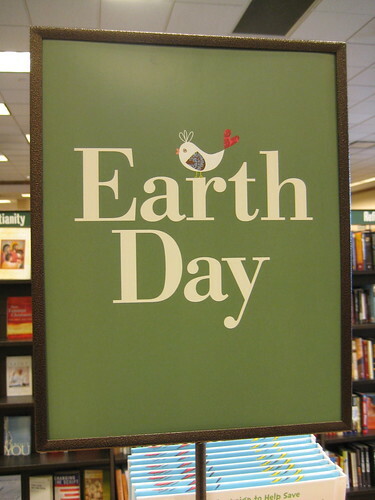 Did you know that Earth Day was started by Wisconsin Senator Gaylord Nelson!? 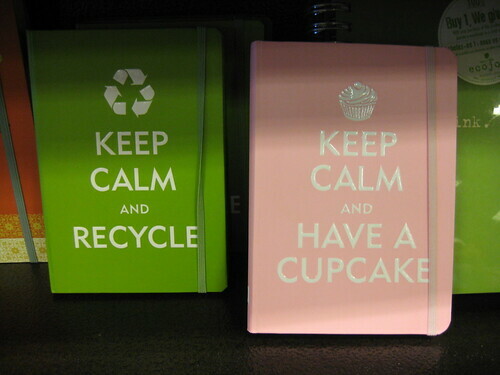 What are you doing today or this year to improve the environment? I will keep using my reusable grocery bags at the grocery store/Target and I’ll continue to refuse a bag when I don’t need one from other stores. I also plan on buying some reusable bags for produce soon. Craig and I woke up somewhat late this morning and it felt so good to sleep in, per usual. 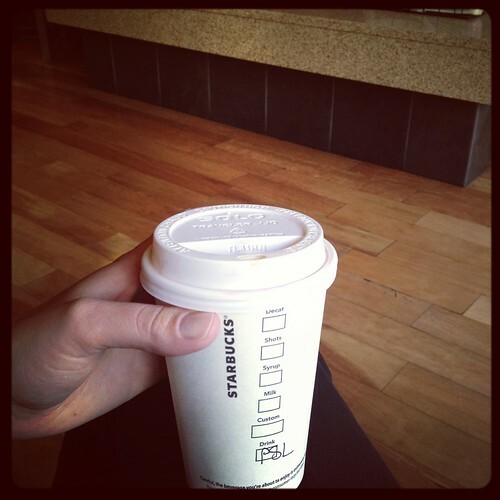 We finally got out of the house and went straight to Starbucks because I needed my coffee fix. I got my free earth day coffee by bringing in a reusable mug. I ordered perfect oatmeal and Craig didn’t get anything because he had his heart set on a breakfast sandwich and they didn’t serve them at that location we went to. We also went to Barnes and Noble to look around. 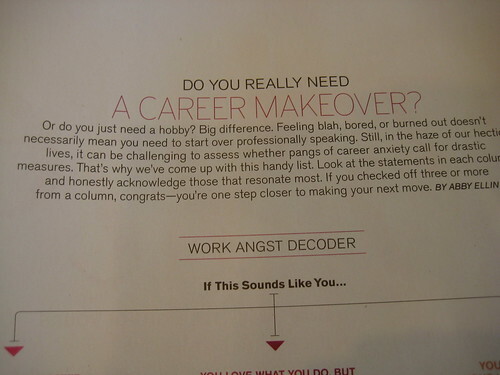 I paged through a Whole Living magazine and read articles like this, which basically told me to look for a new career when I took the quiz! 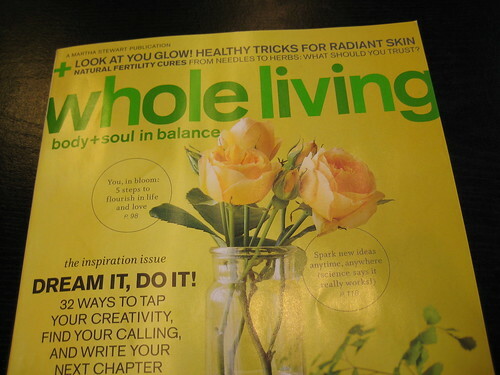 The good thing is that blogging as a hobby outside of my work is a healthy thing according to this article. 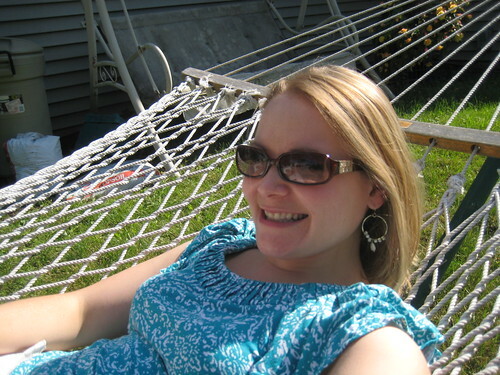 They were just talking about having hobbies in general and I consider blogging a fun hobby that I have learned a lot from and it’s been great to connect with others who share the same interests as me. 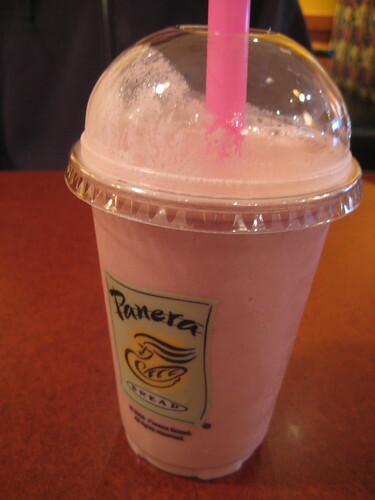 Then we went to Panera for a free low fat wild berry smoothie. I had earned it on my panera card. Boy was it yummy! 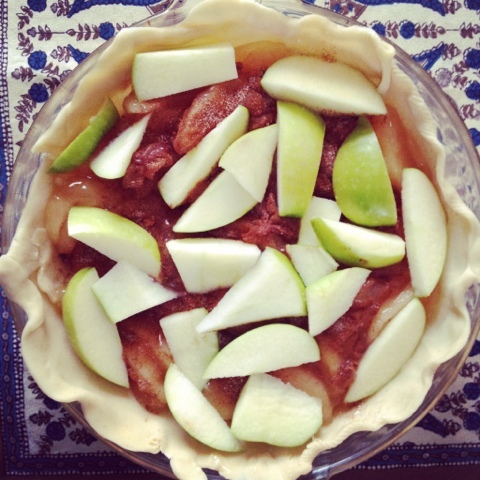 I saw the guy was using Stonyfield vanilla yogurt to make it–sweet! The consistency was not thick at all, but it still was a great smoothie. 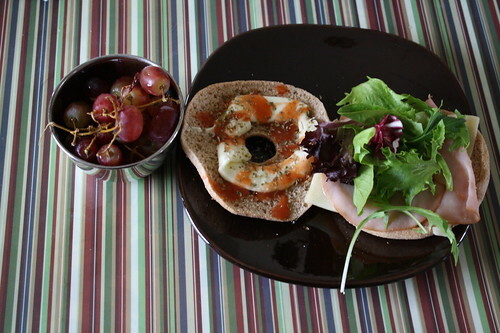 Lunch was a bagel thin sandwich–like I had last night for dinner. Ham and swiss cheese, salad greens, mayo, hot sauce, oregano and sea salt. I had grapes on the side and a small chocolate bar for dessert. 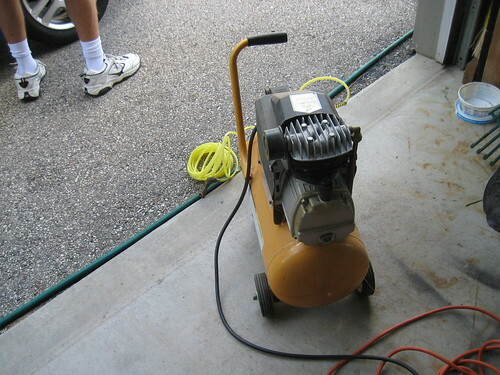 This afternoon, we just got stuff done around the house. Laundry, dishes and general picking up for me (I know it’s earth day and I should have abstained from these two things, but I used natural laundry soap). I wasn’t feeling very good, so I skipped the gym. I also didn’t have a lot of time to build it into my schedule since I have to meditate and eat dinner before heading out of the house again. Later on tonight, I am going to babysit my two nephews. Should be fun since they’re always entertaining to be around! 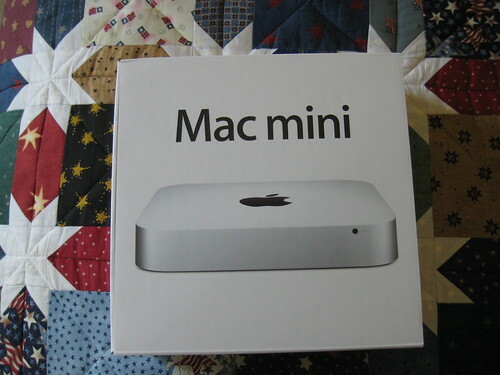 Oh and finally, in case you want to enter a fantastic giveaway–head over to Anne from fANNEtastic food’s site. 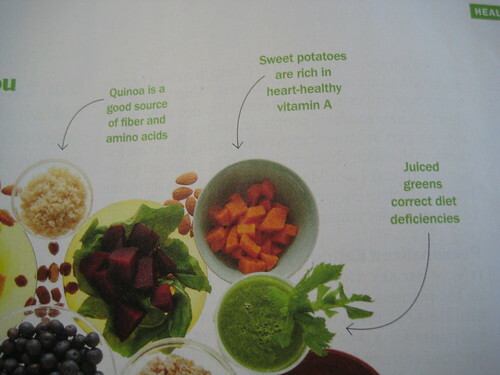 The Food Revolution has begun! Wow, Twitter was crazy tonight during and after Jamie Oliver’s Food Revolution. I am glad he is getting people to support his cause. Too bad he can’t get the LAUSD to do that so far. Go Jamie! We have you’re back! It was so sad to see all of that food the kids brought in from their schools. 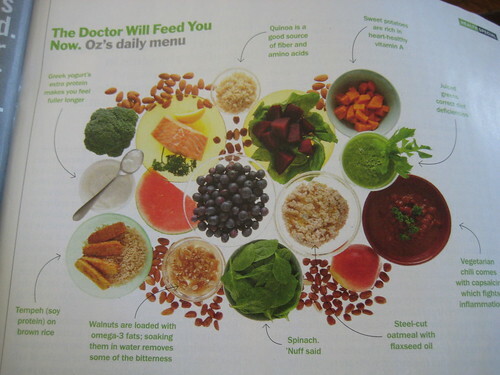 We can do better than nasty food in plastic packaging and sugar loaded flavored milk. Come on America, wake up! 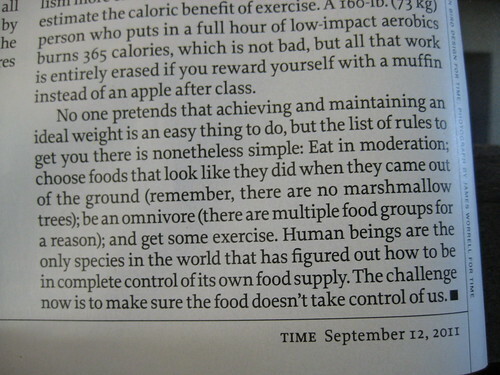 What a sad society we are becoming with our food choices and laziness. Maybe we’ll really become the future human society featured in Wall-e someday. I tweeted that his beef info made me want to become vegetarian. He tweeted in general to everyone that his point wasn’t to do that, but to have people become more educated on the meat they are buying. 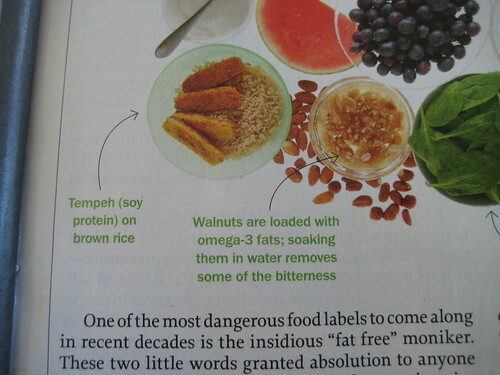 I agree, but since I was a kid, I really never liked meat and thinking about where it came from. 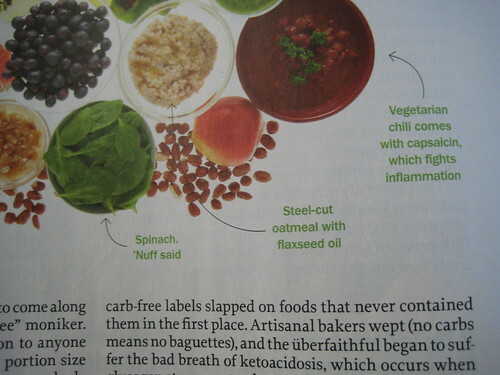 I still am considering becoming a vegetarian since my diet is about 90% vegetarian anyway. 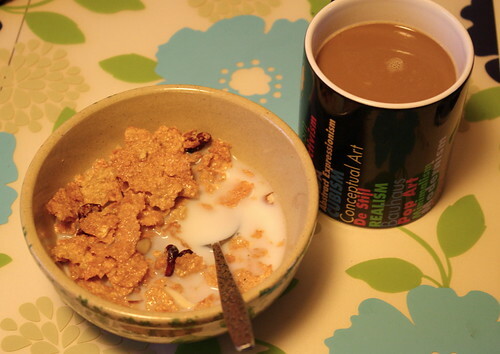 Breakfast–Post Great Grains Cranberry Almond Crunch with skim milk and coffee with So Delicious coconut milk creamer. 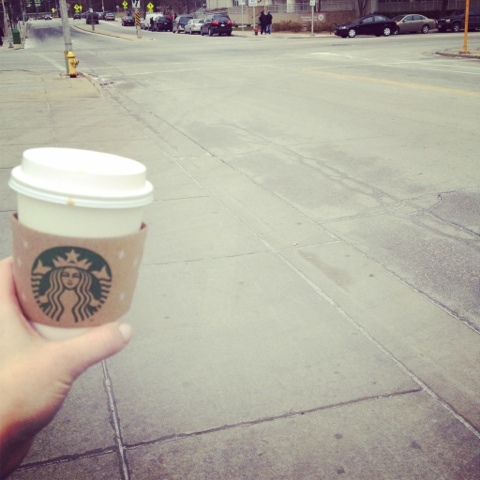 It was a busy morning at work, so I woke myself up with a nice walk outside to Starbucks. 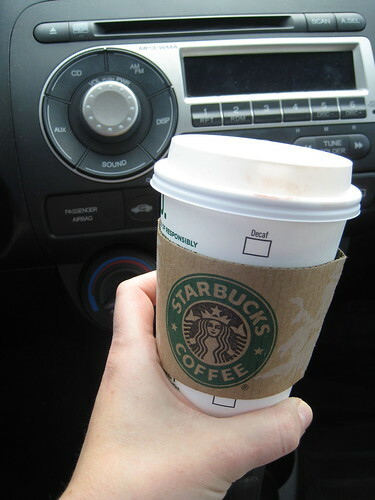 My tall coffee was free because I handed in a Starbucks coffee bean bag. 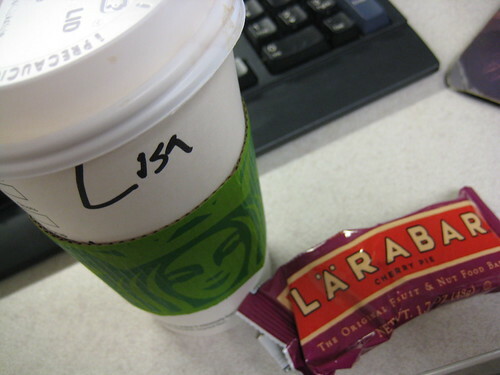 I also munched on a whole peanut butter cookie larabar. 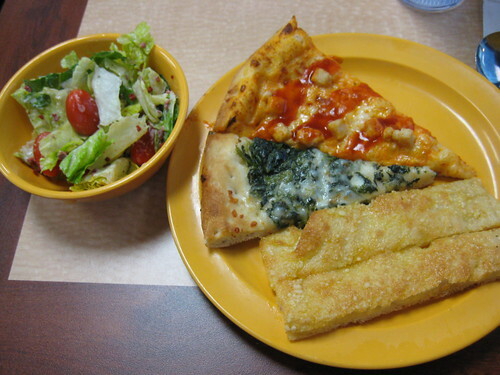 I always tell myself I will only have half, but then once I start eating, I can’t stop! I wore my pedometer at work today and by lunch time, I had about 6,000 steps in! 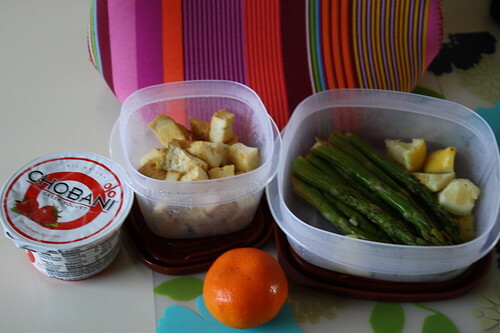 Then it was time to sit, have lunch of leftover tofu & asparagus. 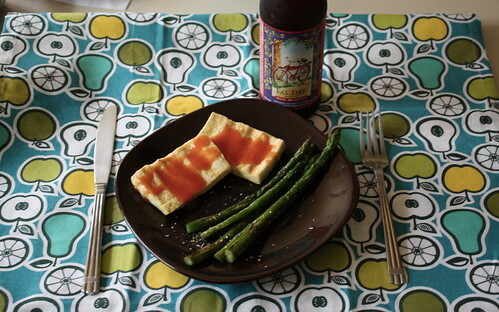 I coated the plain tofu in the lemony garlic olive oil mixture from the asparagus and it was divine. I ate the chobani and clementine as a snack at about 3 p.m. 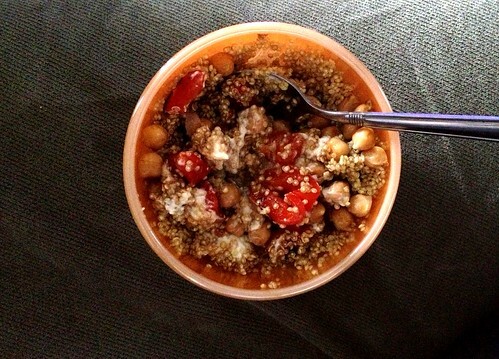 Lunch was actually spent away from my desk instead of reading blogs and a book. I got to attend a lecture at my work and I geeked out with the famous person who was speaking. If I would reveal who it was, my workplace would also be revealed. Let’s just say it was one of the best lectures I have ever attended at my work. I had to stay somewhat later at work, so after I got home from work, I meditated and then Craig was home. We went for a walk/run right away around the neighborhood. 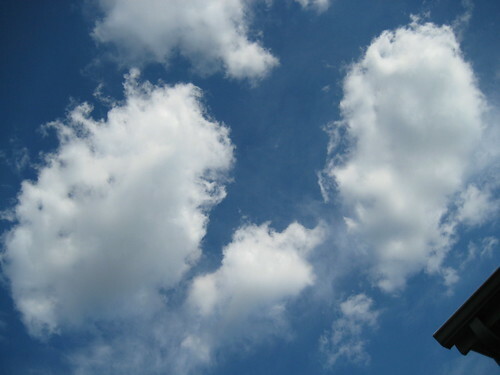 Today was a training day for me to run for 20-25 minutes. I just ran for part of our walk, but we definitely walked for 20 plus minutes. 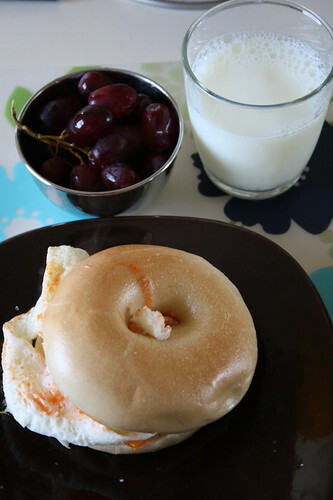 Dinner was a plain bagel with an egg white, cheddar cheese and Frank’s Red Hot sauce. 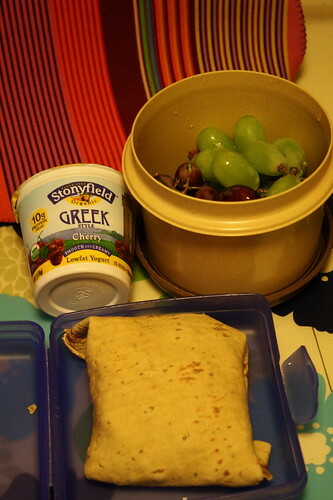 I also had skim milk and some red grapes on the side. It’s late and I want to read before bed, so I am off to read some blogs and a book. Did you watch Food Revolution tonight? If so, what did you think? Did you watch the West Virginia episodes last season? I hit the gym this morning and went swimming (if you want to call it that). You see, swimming and I don’t have the best history/relationship. I used to have a major fear of the water when I was a little girl. I still am not a good swimmer and today’s attempt at doing laps proved that. At first, I tried to do laps and get my head in the water. After all, I bought prescription goggles and I thought I better use them. After I sucked at that, I did the backstroke a couple of times. 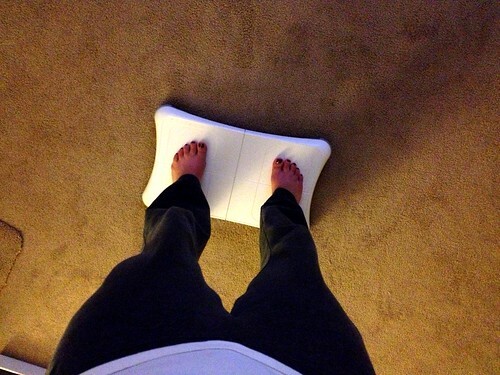 I finally got out and looked for a kick board. That didn’t even help. I gave up, got out of the lap lane and settled on running in the pool. Oh well, I tried for a full half hour to do something in the water. Don’t think I will be putting my swimsuit on for a while. I’ll stick to weights, cardio machines and classes. 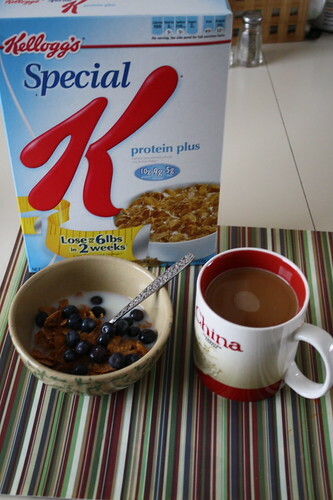 Breakfast was Special K Protein Plus cereal with fresh blueberries. 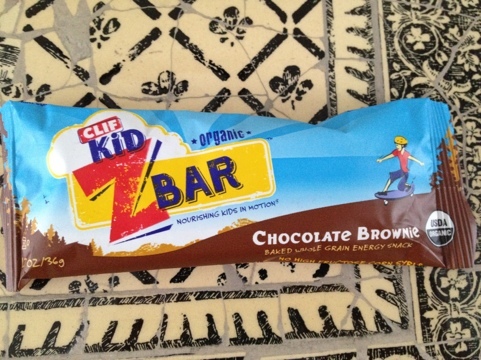 I bought this particular flavor after reading a recent post from A Better Bag of Groceries. 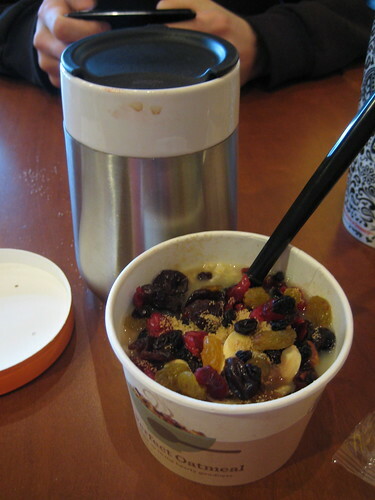 She said that it rated a 60 (out of 100) on the NuVal system, which is really good for a cold cereal. Haven’t heard of NuVal? 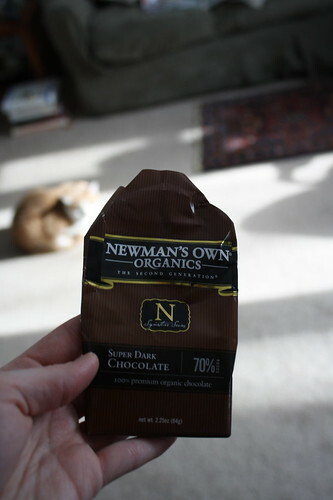 Check out their site–I love the concept and wish we had Nuval scores in Milwaukee area stores. Before swimming, I had half of a banana and finished the other half when I got home from the gym. I tend to get very bad charley horses when swimming, so I figured some potassium right before might help. 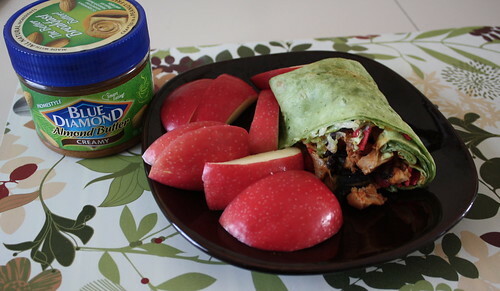 Lunch was my leftover wrap from last night, a pink lady apple, which I dipped in almond butter, and a few pieces of Super Dark Newman’s Own Organics Chocolate. After lunch, we ran to every hardware store possible looking for the appropriate d-rings and hooks to hang our pictures above the couch. We finally found some and realized that not every store carries d-rings, where they might have the hooks, etc. What a pain! 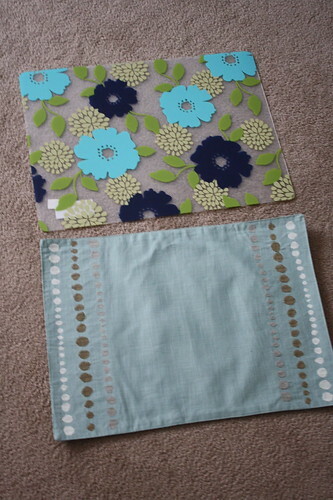 I ended up with some cute new place mats at Target though and they were even better because they were on clearance! One was a mere 98 cents and the other was only $1.98. 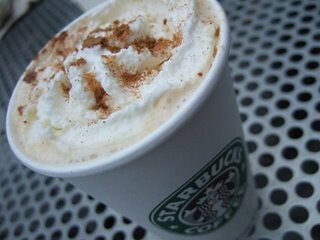 Oh and while out shopping, we got a grande Salted Caramel Hot Chocolate at Starbucks to share. YUM! Dinner tonight was at my mom and dad’s to celebrate my brothers’ birthdays this past week. 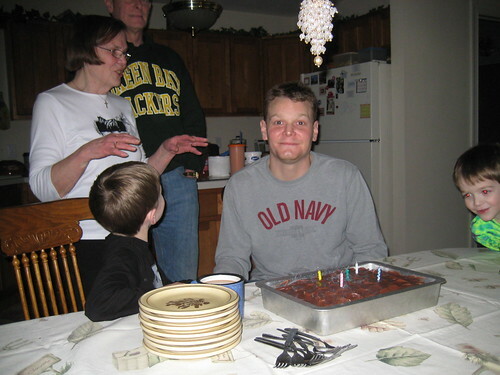 One of my brothers (below) turned 40 and the other turned 51. I am 30. Quite the age difference, huh? 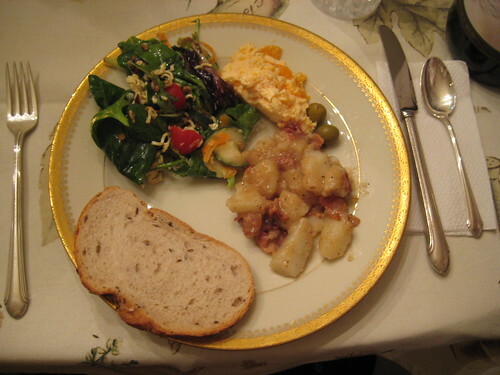 For dinner, I had salad, German potato salad, a piece of rye bread and some jello salad thing with fruit in it. 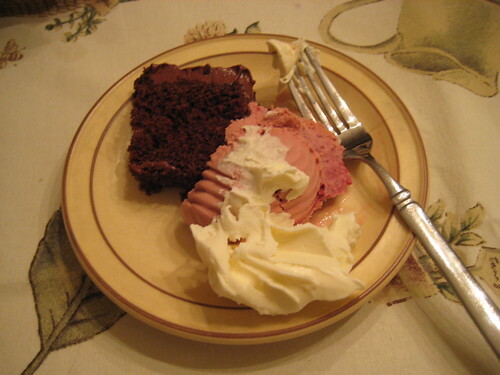 Dessert was chocolate cherry cake and two types of custard-Kopps red raspberry and Culver’s vanilla. Love custard! It was a good, productive Sunday for us! 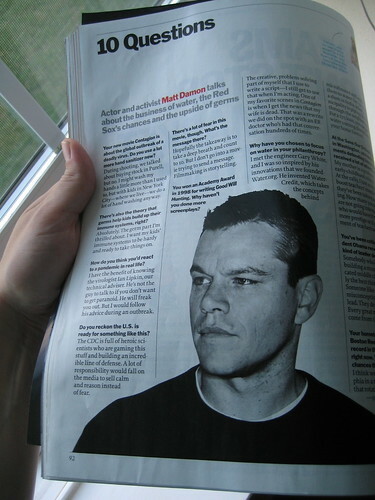 Ooh, my main man Matt Damon is on the Golden Globes, must pay attention. Now I have to get ready for bed and try to fall asleep by 9:45. Back to another week of work!